It has been two months since I had back surgery. Recovery has not been as advertised and I have learned more about vertebrae, nerves, scar tissue and various bodily fluids than I ever wanted to know. At the moment walking and standing are difficult but I have seen some improvement and a full recovery is expected. I recently worked at the bench for the first time since surgery and it did my heart a world of good. 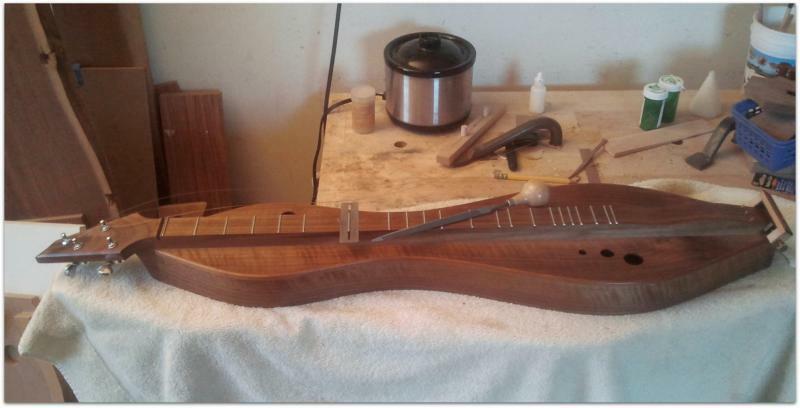 My personal dulcimer has long been in need of fretwork and this seemed like the ideal project to take on. I soon realized my lower body has been more involved when doing fretwork than I had imagined. I never noticed I kneel in front of the bench when checking the frets and fingerboard with a straight edge. I also prefer standing when leveling, crowning and polishing frets. I spent some of the time working while seated on a tall stool. For some tasks I felt more in control of tools while standing and this required taking several breaks before completing the job. After finishing the fretwork I needed to lower the height of the bridge. I set my action to tight tolerances and on a job like this I often drop the action to compensate for the few hundredths of an inch of height the frets lose after being leveled. This dulcimer has an ebony bridge and the height was quickly lowered with a pass or two of a finely set block plane. After enjoying time working at the bench I got to enjoy playing a dulcimer that feels as good to play as when it was new. PS I’ve been doing Transcontinental Meditation on the mantra “A little line for the tench is food for the ghoul” for some years now ; maybe I got the words wrong??? You’re right as usual Doug Berch. Take it easy, but … take it!! That what the cobbler said (but didn’t post on facebook).